This is a reader request. Proof that if you twist my arm hard enough I’ll review the latest full titanium Zero Tolerance flipper. Only for you guys. The Zero Tolerance 0609 is an R.J. Martin design, and is another step in ZT’s trend of releasing smaller, more EDC friendly knives. 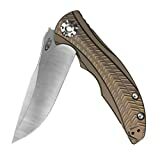 The last R.J. Martin / ZT collab I handled was the 0600, a massive, 9.5″ framelock flipper. It was big and beautiful piece, but few people are going to want to carry a folding knife with a 4.25″ blade on a regular basis. Plus it was a $400 limited edition knife. The 0609 is much more reasonable in its footprint, price point, and availability. When you consider that I reviewed pieces like the 0300 and 0560 only a handful of years ago, it shows how the market has evolved. Big chunky knives are losing favor to more pocket friendly offerings. Lets take a deep dive into this recent release from Zero Tolerance. The 0609 has an overall length of 7.4″, a 3.4″ blade, weighs 3.3 ounces, and is made in the USA. This is a good size knife, but you may be surprised to learn that the 0609 is both smaller and lighter than a Benchmade Griptilian. I think this is a great size for those wanting a full size knife, but still something thin, lightweight, and special. The blade is a twist on R.J.’s classic drop point, found on models from his Q36 customs, to the Kershaw Volt. This particular blade has been given a harpoon and swedge, lending a more exotic, technical look to the knife. Blade stock is thin, clocking in at .12″ (just over 3mm thick), and the high flat grind combined with a wide edge makes for a knife that slices well right out of the box. I had no problem slicing apples, and the knife absolutely decimates cardboard. Blade steel is CPM-20CV, which is chemically similar to M390, but made in the USA by Crucible. Edge retention has been excellent and there are no signs of chipping or rolling. No issues with rust or corrosion either. The knife has served well in its role as a high end EDC or “gentleman’s tactical” folding knife. It’s a knife that has been built for speed. I can’t help analogizing it to a sports car. It’s low-slung and has a premium feel. The 0609’s handle is comprised of two heavily milled pieces of bronze anodized titanium. The anodization is interesting, as the bronze picks up hues of blue and purple from the oils on your skin. I think it’s a nice change of pace over standard raw titanium, but wonder how it will wear over time. Handle construction is simple and clean. You have two simple handle pillars, and then you have the oversized See-Through Pivot (STP). The STP is an R.J. Martin creation that allows you to see through the pivot. It’s cool and different, but the draw back is you need to buy a special tool from KAI to adjust the pivot or take apart the knife. That’s a definite drawback to an otherwise practical offering from ZT. Still, the STP is one of the more interesting details of the knife. The ergonomics of the 0609 are pretty good. The handle is long enough to accommodate a full 4 finger grip, while the textured titanium, jimped thumb ramp and spine, and finger grooves all serve to lock your hand in place. The only rub is that this knife is 1.125″ at its widest. Its very thin, making it great for carry, but less comfortable for extended use. Personally, I’m fine with sacrificing a little ergonomic comfort for a lighter and more streamlined knife, but if you are expecting this to fill the hand like an 0808, well, it won’t. For carry the 0609 comes with a simple inoffensive pocket clip. Even the Zero Tolerance logo has been dialed back on the clip of this knife. Gone are the days of the big “ZT” billboard. Now we have “Zero Tolerance” lettered in a small and spare font. The clip offers good retention and the knife rides relatively deep in the pocket. The handle has been drilled and tapped for ambidextrous tip up carry. In practice the 0609 carries great. It’s slim, and lightweight. You will quickly forget that you are even carrying it. The sturdy pocket clip keeps the knife firmly in place. Perhaps a deep carry clip would have been nice, but this clip is small and stays out of the way. Like most ZTs, this is a titanium framelock flipper. And once again, Zero Tolerance demonstrates that they know how to put a titanium framelock flipper together. The flipper tab is prominent and lightly jimped. The blade pops open easily with either a push button or lightswitch flick. The detent is strong, and the blade rides smoothly on Kershaw’s KVT caged bearing system. For lockup we have a titanium framelock with stainless steel lockbar insert. Lockup is early and secure. There is no play in any direction and the lockbar disengages easily without any stick. I often consider Zero Tolerance to be the best in the business when it comes to production titanium framelock flippers. The 0609 is another example of why that’s the case. Here is a shot next to my ZT O450CF. It’s actually not much bigger than the 0450CF. Mostly it’s a wider knife than the 0450CF. I think this is the most refined non-limited production ZT I have handled to date. Clearly they have listened to customer feedback, and this strikes me as an evolution of the Zero Tolerance lineup. Some people may want big chunky folding knives, but there are plenty of us who want something thin and light. While the brand has been obviously trending towards more practical knives over the years, this 0609 strikes me as the total package. A slick R.J. Martin design, a thinly ground blade married to a lightweight and strong titanium handle, with great flipping action and solid lockup. What’s not to like? The answer is “not much”. It’s a great knife. Even the price is reasonable. These retail for a little over $200. Not cheap by any stretch, but not unreasonable for a USA made premium pocket knife either. This is easily my favorite regular production Zero Tolerance folder to date. Highly recommended. I recommend purchasing the Zero Tolerance 0609 at Amazon or BladeHQ. Please consider that buying anything through any of the links on this website helps support BladeReviews.com, and keeps the site going. As always, any and all support is greatly appreciated. Thank you very much. Nice review, was just considering one of these. One note, not important in the grand scheme except for those new to the knife disease; CPM-20CV is made by Crucible, not Carpenter. Yep, and the Carpenter equivalent steel is CTS-204P. Nice! I hope you enjoy it. Is it sensitive to lockbar pressure? My ZT0450CFZDP is. Chad, I haven’t had an issue with that at all. I should also say, that I am also a lefty. Phew — that one’s purty.